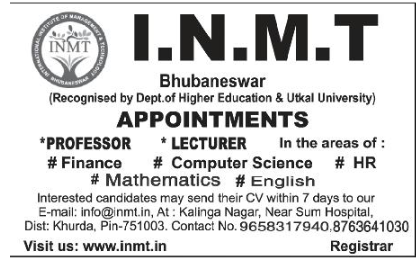 I.N.M.T , Bhubaneswar has advertised in Samaja newspaper for the recruitment of Professor / Lecturer jobs vacancies. Interested and eligible job aspirants are requested to apply with in 7 days. Check out further more details below. About College: Since its inception, INMT has been maintaining a group of professionals who believe that with passage of time the excellence of quality education has to be maintained by providing excellent academic delivery and infrastructure to its students. At INMT, we offer innovative and globally accepted programs and great opportunities for all-round development. 100% case-based learning is unique to INMT and transforms its students into leaders of the future.